Garlic is AMAZING! Garlic is POWERFUL! MOST ancient civilisations used garlic to fight heart disease, cancer and other ailments. It’s also an anti-parasitic. Maybe that’s why vampires are so afraid of garlic! !! NOTE: This recipe requires an OVEN !! 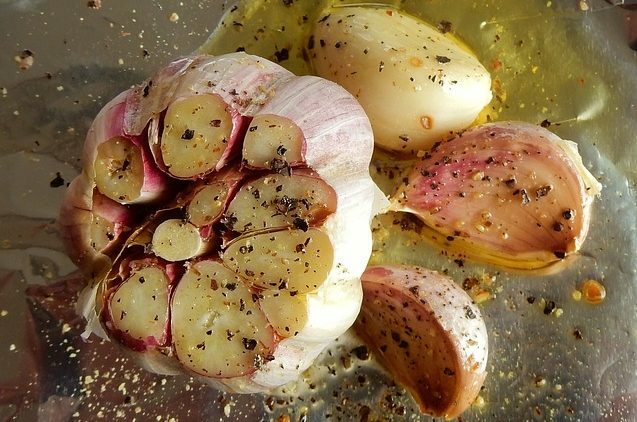 We hope you enjoyed this SUPER SIMPLE way to enjoy garlic on its own. 2) Next, take the garlic and cut the top off with a knife. Peel the skin off. 3) Lay out the aluminium foil and place the garlic on top. 4) Pour the olive oil over the garlic and season with a pinch of salt and black pepper ( to taste ). 6) Pop the tin foil bundle into the oven and let the garlic cook for 45 minutes. 7) Once cooked, carefully unwrap the tin foil. 8) It is now time to enjoy your SUPER HEALTHY YUMMI-LICIOUS GARLIC!